If you’re still surface sanding with a handheld sander, then you’re really going to love this 10" Drum Sander. 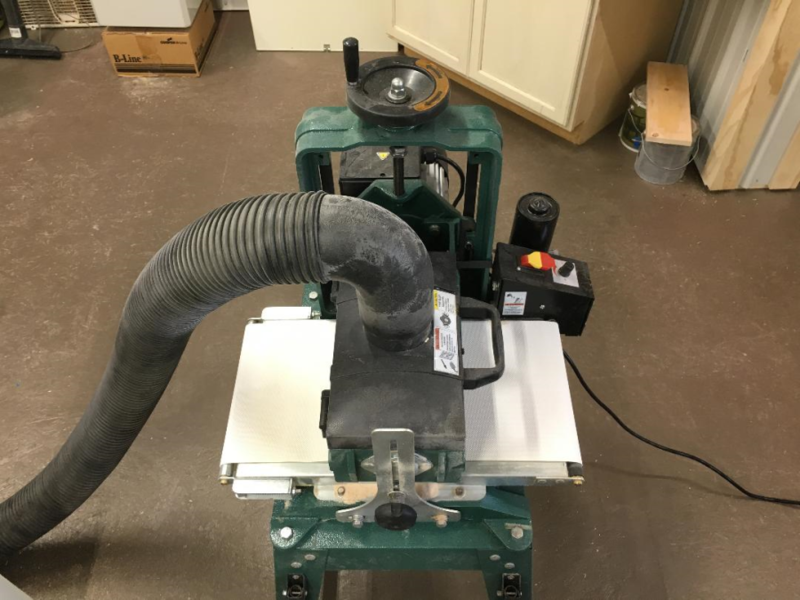 With a 1-1/2 HP 110V motor, this sander has plenty of power to handle lumber up to 9-1/2" wide, and the variable speed conveyor lets you dial in the perfect feed rate. Includes adjustable spring loaded pressure rollers and 4" dust port. 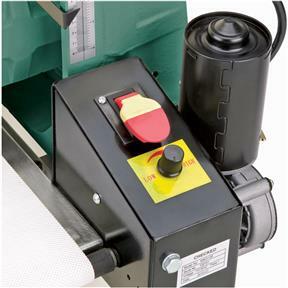 Accepts easy to install 3" wide sanding rolls. Drum size: 5-1/8" x 10"
Approximate shipping weight: 220 lbs. Worked right of the box. I purchased this drum sander to act as a thickness planer. I resaw with a tablesaw and bandsaw and use this to final size the work pieces and get rid of the ridge left after the resaw operations. 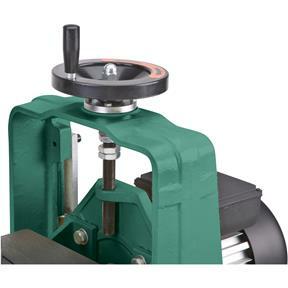 I use this to level segmented rings for bowl turning, works great. I needed a drum sander and this was the only one I could afford. I work on small artisan boxes with bookmatched wild grain tops and flattening the glued up tops without tearout was a real challenge. I knew I needed a drum sander but most are very expensive. cutting boards and will test this ability at that time. This came packaged very well. I have set it up and used it a few times. It works very well. I had no problems with set up or using it. I would recommend this product. 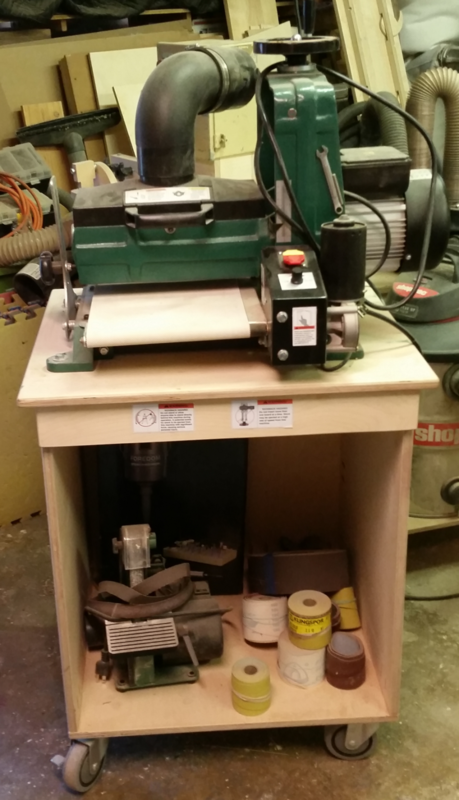 After a bit of a "learning curve" to attach the sand paper, this machine had turned out to be a valuable addition to my workshop. Purchased this 10 in. Drum sander to bail me out saving squirrelly grained stock which previously had to be hand finished if the jointer and planer couldn't handle it. Slow, but speed not a factor when saving stock which previously would have not been usable. Purchased it to replace a poorly designed Jet 10/20 Max. Have used thus sander several times on walnut, oak, and pine. Works fantastic. Overall a nice unit for a great price. It has saved hours of mindless sanding for me preparing maple for staining. Once I figured out how the sandpaper is loaded I can change out the role in less then 5 minutes. The only reason for the 4/5 rating is the height of the sander. It is about 4-6 inches to low for it to be comfortable to use for a hour. I've been using this machine for about five months now and can honestly say that I'm impressed. 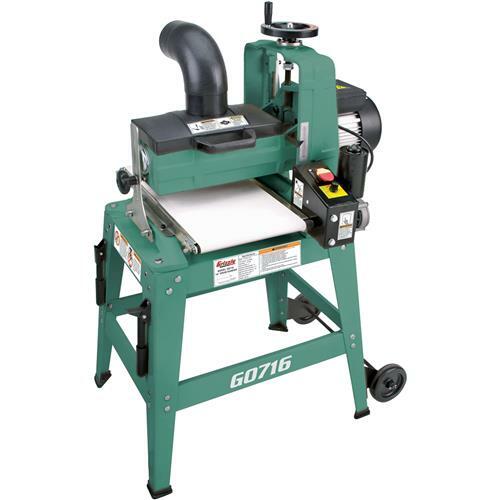 I bought this machine because I a) have a small shop b) needed a sander to take away some of the drudgery of sanding long boards with a RO sander c) did not need to "thickness sand", I have a planer for that and d) had around a $500 budget. This sander has met all four points very well. 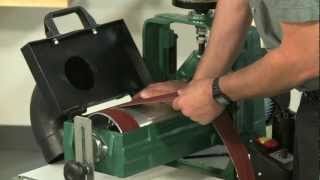 Here are a few things I learned about this drum sander: There is a technique to using a drum sander. I struggled with poor performance until I watched a few YouTube videos and gained on insights. You can't use this as you would a planer. 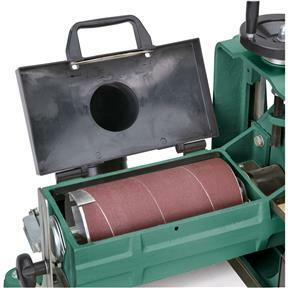 I can use between a half turn to a full turn of the hand wheel on the planner and get excellent results, The drum sander requires only an eighth of a turn, if that. I use a higher grit (150, 220) on this drum sander to get a finished sand. Lower grits really remove the wood but leave a pretty aggressive scratch pattern, when compared to a random orbit sander. You can remove the outboard support to sand wider panels with good results. Wood would slip on the feed belt when I first got it but have had any trouble with it now, probably because I figured out to go easy on the hand wheel! The stand is junk. It is too low. The low position will kill your back by the third pass through. I built a baltic birch plywood cabinet with drawers (well, someday) for this to sit on. the outfeed is the same height as my bench. Overall.... this is a nice little sander and I'm happy with the purchase. Been using this drum sander for a couple of months now, and I'm very pleased with how it performs. I use it mostly for sanding rings for segmented bowls. For this it works perfectly. All great on sander except very low to floor. I used the shipping container to build platform to raise unit 9 inches All is good now. No vibration and operation makes little noise but lots of dust. I make segmented bowls and this is just what I needed to sand segmented rings. The belt looks frail and the stand is 11" to low. However it functions and allows good glue joints. Great value, works like a charm. I make small wooden boxes using lots of burl wood, and this is perfect for reducing the thickness of the burl slices. I would not recommend for any heavy work as the motor bogs down easily. My wife and I purchased this in August 2016. My son and I put it together in about an hour. Very quiet, I sanded 8/4 cherry bowl blanks and some spalted maple. To our surprise did a great job for a small drum sander. Both my wife and I give it 5-star rating. A solid little machine with a great price. It will pay for itself in no time. Me for getting a great gluing surface for my bowl blanks. My wife for her business. I just bought this, but I have put it through a good test. I am a home woodworker. This summer, I have been working on a pair of rocking chairs with bent lamination rockers and back rest rails. I have been using a friends drum sander for years, not a grizzly product. The gears on the drive motor stripped after 15 years. A new drive motor has been hard to get, expensive and of course on back order. The rockers for my chairs were finished, but not the back rails. I wanted to finish the chairs before my vacation ended, so I began to look to buy my own. Grizzly had the best price for the size I am looking for. The customer support office was excellent, friendly, knowledgeable and fast. I got it in just a few days. Set up was easy it took about a hour and half to set it up and make the adjustments as directed in the manual. I jumped right in. I ran 16 pieces of white oak 3.5" wide by 24" long. I needed to sand each piece down to less than a 1/4" for a bent lamination. This is what I learned. 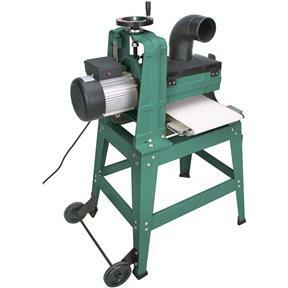 This drum sander produces evenly sanded lumber. After sanding, the lumber is even in thickness across its width and length. This is a heavy piece of machinery, mostly made from cast iron. Runs very quite almost no vibrations. 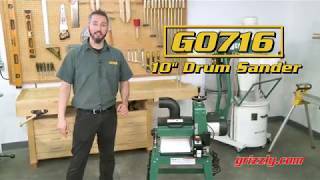 The drum motor is very powerful and the drive motor easily pulled the wood through the sander. As a test I put a piece of white oak over 8 inches wide and it surfaced one side perfectly. It did a great job. Putting on the sand paper is very typical of these types of machines. I like 100 grit. Any coarser and it would take a lot more finish sanding. As for installing the sand paper, follow the direction and it goes right in. The dust collection port is large and moves a lot of air with saw dust. Just a little dust escaped. My only negative is the stand is a little short. If it was taller it would be a little more comfortable to use. The shorter height did make feeding wood in and picking up the wood from the out feed easy. Another bonus is that I am going to make a out-feed table from the plywood crate the sander came in. High quality great machine. Its a great size, it doesn't take up too much room in my smaller sized shop. Yes you can spend more, but then you would have any money to buy any lumber. Yes my friend whose drum sander gave up the ghost is coming over tomorrow to try out my grizzly drum sander. Purchased the sander about three months ago and have been pleased with its performance. 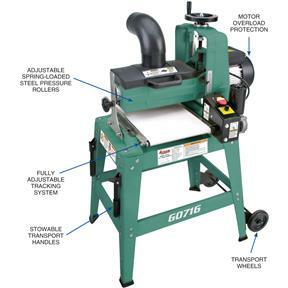 I considered a few of the bench-top models Griz offers, but because we simply don't have time to fool with the feed motor problems a number of the reviews discussed, we opted for this simple, more straight forward model and are pleased that we did. It does a remarkable job on the cabinetry we produce, is easy to operate and simple to maintain. Don't believe the comments on the belts being hard to change - just follow the directions and have a little patience - unless you're going through more than one day, its really not an issue. As mentioned, the machine is simple and easy to operate - not a lot of stupid bells and whistles - and can be easily rolled out of the way when not in use. It's not our first Griz machine and won't be our last - we love the sound quality, competitive price and great service that they provide.